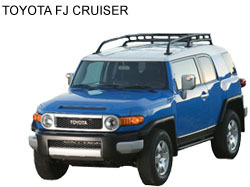 Costa Rica Rental Car has gone to great efforts to only use reliable car rental companies. Please take our word as an absolute - do not rent cars from companies here unless you know their reputation or rely on someone who lives here like Costa Rica Rental Car. The companies we use always have your car on arrival, some others overbook. There is a shortage of rental cars in Costa Rica 6 months of the year. 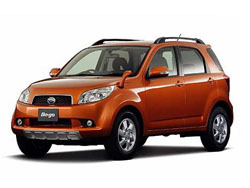 Caution: Many agencies in Costa Rica rent 2 or 3 year old cars at slightly lower prices - WE DO NOT! manual is $12 week less. See 5 passenger Prado below. Slightly bigger version of the 4 runner. The above rates include tax and unlimited mileage. IMPORTANT NOTE: As of May 1, 2001, the new airport manager WHICH IS GOVERNMENT CONCESSION at SAN JOSE AIRPORT has put into effect a 12 % concourse fee on all car rental companies at the MAIN TERMINAL ONLY. Orbit will makes sure "YOU CAN AVOID THIS CONCOURSE FEE" by looking for sign outside immigration exit for our SHUTTLE SERVICE TO THE RENTAL LOT 4 BLOCKS AWAY. THERE ARE TWO IMMIGRATION EXITS CLOSE TO EACH OTHER SO PLEASE LOOK FOR SIGN AT BOTH EXITS IF YOU DO NOT SEE IT RIGHT AWAY. Nothing charged to credit card until arrival, no cancelation penalty 24 hours in advance. We will send confimation with telephone number and all details. Please make sure to include your e-mail address if you send by fax. Subject: Re: Do you have any information? I have been to Costa Rica 3 times. The very last time, I rented a vehicle, which overheated and we had to nurse to Liberia. Unfortunately we had to leave it there (but had notified the rental company and awaited their call for advise). Ex----- Car Rental Co. (now Tall--- FICA) posted the money we owed for the rental on the credit card (plus one day we didn't use) and very quickly posted the deposit of c330,000 colones ($1229.32) to the account as well, even though the car had been returned and accepted. To make a long story short, if our friends in CR had not been as tenacious as they were and if they had not been assisted by their attorney, we would have been another theft story. I can only imagine how many people have been taken advantage by Mr.Exo---Scum-bag. So there you go . . . Thank you again for a reference on a car rental company. My tendency would be to use an american name. What do you think? Flat Rates Travel handled over 2700 reservations last year. We only use the 3 rental car companies out of the 100 or so as I explained to you in last message. We give them so much business that they pay attention immediately to any complaints from us. The complaints have been few and far between but the ones I remember best in last 3 years were as follows. MODEL. RENTAL CARS HERE ARE SUBJECT TO MUCH MORE WEAR AND TEAR SO WE ADVISE ONLY NEW MODEL YEAR RENTAL CARS. The last question about renting from some company that has an american brand name is a little tricky. Many car rental companies here will use a brand name you are familar with and which may or may not have any connection to the same name american brand name car rental company. Almost without any exception however the rental company here is not a division or branch of any american brand name. One of the companies we use which is absolutely first rate pays for the use of an american brand name but i assure you the ownership is completely separate. again for your follow up. Will not hesitate to recommend. Please feel free to use me for reference as it was most helpful to not have to leave a non-refundable deposit when we had no idea if we would be able to make the flight. But that is the downside to traveling for free. YOU WENT BEYOND THE CALL OF DUTY TO HELP US GET THE 4 RUNNER AND THE SERVICE WAS GOOD AND THE CAR WAS IN GOOD CONDITION AS PROMISED . Once again thanks for your help. duty, and I would recommend his services to anyone traveling to Costa Rica. With Harold on your side, you can't go wrong." through out the entire continuum of my visit. Costa Rica which can not be too soon. Harold, the truck was great, nice advice on the Toyota Hilux, what a truck! You've got yourself a pretty nice country there, great people. another vacation. Thanks for all your help. Wonderfully! Seth had no trouble with either the car or the service. He was able to pick up the rental when he needed it. Everyone was courteous, well organized and helpful. thanks for your help with our rav4. we had a great time and things went very smoothly with the car. whatsoever driving it to Monteverde and Tamarindo. Thank you for your help. Everything went fine while we were in Costa Rica. well for us. We would certainly use you again. Your assumption is correct it is the American Bar Association. You might remember me, last February-March I rented a 12-pax Toyota minivan from you guys but I was terribly paranoid about renting from you just because it was over the internet. Furthermore it was my first time to Costa Rica and I had serious concerns about renting a car because of all the horror stories I had heard. When we arrived at the airport everything was in order and when we returned the vehicle there were no surprises about what we owed. Also I am so glad we rented a new vehicle because those roads in Costa Rica do terrible things to vehicles in a short time. The only problem we had was a flat tire which we were able get patched for just three dollars. Now I am looking to travel to Costa Rica with my wife and I wouldn't feel comfortable renting from anyone else. Everything that you arranged for us worked out great. Thanks for your help. PO Box 885, 95 Crisci St. Sorry you didn't receive it but I sent a note back upon return from our trip. Thank you for organising the requested bookings. The trip was excellent and I really appreciated the Rav 4 advice. I would consider this mandatory for the Monteverde/Arenal route and it made the whole trip more pleasant. Most of the Guanacaste roads could really use a 4 wheel drive too and certainly the more interesting routes. I few little updates. The trip from Arenal to Monteverde is a good 4 hrs and Monteverde to Samara 6 hrs. The Flamingo Marina is NE facing, has no reasonable beach and is a real wind corridor. It is probably OK for a boat mooring, but was not what I was looking for and has seen better days. The beach to the south of the peninsular is very good if anyone is in the area. The El Ocotal has a dangerous beach and is posted as such, and has neither sunrise not sunset, facing north. The bungalows have bright furnishings, but the ants have made a home in the rooms and turn over would appear to be low, so maintenance is less. The restaurant has a nice terrace, but on this occasion the wind was incredibly strong and took the edge off it. El Sapo Dorado trails are too close to development/farmland to be rich in wildlife, but the location is fine and the new Skywalk through the forest canopy a few to the north km (not in the Monteverde park), even in the torrential rain, is magnificent and a must for anyone in the area. The comments are just to help with advice for others - trip was really good and I thank you again for arranging the bookings. happy to serve as a reference. Back to the real world. It was wonderful and Costa Rica is beautiful and the Tulemar was fantastic selection for our honeymoon. The white water rafting and the crocodile tours you selected for us were great with first class guides. We now completely understand what you meant by being careful about renting cars in Costa Rica and we suggest to anyone who rents a car to have a third party like Flat Rates Travel there to stand up for the tourists if the rental car company tries to give you a poor quality car. P.S. Tulemar was great. Gilbert at the front desk was extremely helpful and pleasant and went out of his way to help us find things. Rooms were perfect and spotless. Tara had view of top of the world. Cathy. Re: March 20th Sorry it's taken me so long. I still feel like we got back yesterday -- it's just been one very long week of playing catch up. First -- it was great meeting you and thanks very much for your help. We had a great time and no question, we'll be back. Now that I've been there, I realize how much hand-picking you've done -- and how narrowing the field to the really good places is really a valuable service. Each of the places we stayed was really nice. Parador was actually better than I expected. It's really a restful and relaxed atmosphere with the sprawling grounds, the large area by the pool (compared, say, to Mariposa.) If there was a casino or disco, I never saw or heard it. It's in the specs but either it's not in use or not there (which was good.) Needless to say, I was relieved that the place was as low key and disco-less as it was. Xandari is really, really cool and we want to go back. They've really thought of everything. (Apparently, Leona Helmsley is not the only one who believes in plenty of big fluffy towels and terry robes.) You're right -- all we needed was more time. Although Julian started having Nintendo withdrawal symptoms by the end. (I did plan too much road time the first three days -- to Arenal on Day Two, to Manuel Antonio Day Three.) But the drives were plenty gorgeous. Anyway -- we'll be in touch and hope to see you again next year same time. And if you ever need/want to use me as a reference, feel free. Hello Harold!! Thank you for your interest about my experience renting a car with your agency and the Toyota renta Car. I was very happy with the service every one there was very helpful and the service couldn't be better. I will continue to use your services in the future and will recomend to others using your agency. Thank you and it was a pleasure to do business with you. Many thanks for making our fist trip to Costa Rica a great vacation. The first night at the Rodeo was fine and the accommodations were great. However the real Costa Rica opened up when the Suzuki Sidekick you reserved for us took us to the Tulemar in Manuel Antonio. What a jungle and beach paradise. The ultimate however was back to San Jose in the mountains at the Xandari. The Xandari is not in this world but closer to heaven. Harold, I will recommend your service to others. Harold - Thank you for your timely reply. The car rental was good. No problems with the van which, did indeed, fit all 8 of us plus our luggage. Our one night stay at the Arenal observatory Lodge was great. The volcano was active, billowing smoke, and glowing red after sundown. The hotel staff and restaurant staff were courteous and helpful. The final mile of the drive to the Lodge was a workout for our fully loaded Mazda Van. I would recommend the Lodge to anyone. The El Ocotal resort was nice...but...I walk with a cane, and I had a very hard time climbing the walkway between the lobby/restaurant and my room. The walk down to the beach was likewise a hard chore. I would not recommend this hotel to anyone with physical disability which effects the ability to walk far distances. This difficulty caused us to leave the Resort one day earlier than planned. The people at the hotel were helpful and courteous. The Villa Teca Hotel was good fun. We were the only guests there the first night. The friendliness of the Hotel employees during our stay was excellent. would also reccomend this Hotel to future guests. The Manual Antonio area is a very special place. I am from Phoenix, Arizona, and would gladly recommend your services to all interested parties planning a trip to Costa Rica. Napolean- Accommodations are nice, breakfast was an added bonus. Ocotal - Beautiful! The hotel is in a wonderful location. A little remote for the teenagers - but we had a wonderful time there snorkeling and going into coco. that abounded, the room large and comfortable! The New Year Party was fun too! The auto Rental - perfect - everyone was very accommodating. effort. Let me know if you would like any other info. We just returned from a wonderful vacation and wanted to thank you immensely for all of the help you provided. The Buena Vista Hotel was perfect - Ed was there to pick us up at the airport. The Toyota Hi Lux was a perfect vehicle for us - and the price you got for us was well below all of the other places I had priced around for. We really appreciate all of your help, especially your promptness in answering our e-mails. We will definitely recommend you to others. Thanks for the making the auto reservation and for the advice on the Rav 4. I had a great trip and would recomend your services to anyone. I think its important to have a third party such as yourself to help negotiate if there are any problems. Thanks again and good luck.